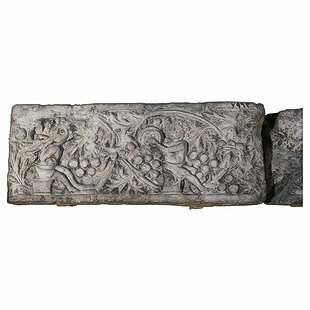 The limestone cornice has five scenes representing grape harvesting. It is thought to have been divided into five pieces in the past by archaeologists to obtain a higher price for it. The scene begins with a man standing amid the vines, harvesting grape clusters with his hands. A second scene shows a man putting the clusters in a basket to be carried away. In the third scene, a musician beats a tambourine in happiness for the harvest. The fourth scene is of the grape baskets being loaded onto camels to be carried to where they will be pressed.